The contents page. Pages required for the departure are listed on the left hand side. 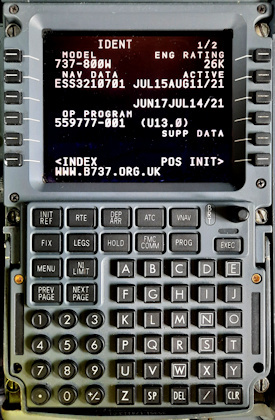 This INIT/REF INDEX page (shown right) is from an U6.2 aircraft equipped with ACARS and IRS navigation. Selecting MSG RECALL allows the recall of deleted CDU scratchpad messages whose set logic is still valid. ALTN DEST allows the entry of selected alternate airports. IDENT: Check aircraft model and engine rating is what you are flying, especially if your airline operates a mixed fleet. Also check the database effectivity and expiry dates. Software update number is given in brackets, here U10.5A. U10 was specifically designed for the 737-NG but can be used on classics. Standard take-off page for PF. Speeds & assumed temperature must be entered manually from performance tables. TO SHIFT should be entered if departing from an intersection as this is used to update the FMC position when TOGA is pressed at the start of the take-off roll. Notice that the reduced takeoff N1's (90.5/89.6) are different for each engine. This is because when the photo was taken only one pack (the right) was running. Standard ECON CLB page. 302 (Kts IAS) is highlighted indicating that this is the target speed, this will automatically change over to mach (0.597 in this case) during the climb. Other climb modes are available with keys 5 & 6, L & R. CLB-1 indicates that the autothrottle is commanding a reduced thrust climb power (reduces N1 by approx 3% = 10% thrust reduction). CLB-2 is a reduction of a further 10% ie 20% total. The reduced climb thrust setting gradually increases to full climb power by 15,000ft. When the LT or RT engine has been selected this page shows your MAX ALT (climb or driftdown alt) TGT SPD and max cont N1. This is a useful page to check if flying over ground above 15,000ft. Remember the altitude penalties for anti-ice. The EXEC light will now be illuminated, if you press it you will lose all VNAV info. Select ERASE to return to the two engine CLB/CRZ pages. APPROACH REF: Standard landing page for PNF. Vref is calculated from the current gross weight, pedants may wish to overwrite the GROSS WT with the predicted GW for landing. Vref is "hardened" by line-selecting it over itself which will cause it to be displayed on the speed tape. All the diversion data is now shown based on you flying direct to this airport from present position (VIA DIRECT). Selecting MISSED APP will show the same data but calculated from the missed approach point. Selecting INDEX to return to the normal pages.